It can be difficult to live in a house with negative energy. The thing is, that most people think that this has to be paranormal- but it doesn’t. It can be difficult to live in a house with negative energy. The thing is, that most people think that this has to be paranormal- but it doesn’t. Paranormal negative energy, resulting from spirits or demons who have a bone to pick or who can’t move on is, undoubtedly one of the most common reasons people seek to send the negative vibes packing. But dispelling negative energy can be helpful for those who have an illness, those who have had a turn of bad luck, or those who have had a recent break in, and feel unsafe in their house. There are many different ways to do this, but Smudging as listed here is the most effective at not only banishing negative energy from a space but for maintaining the peace of that space once you’re done. The thing is, and this is the most important part, that someone else cannot do it for you. If you live in the space that needs cleansing, you have to do it yourself. On top of that, it must come from your strength. It should not come from a prayer to the divine, and it should not come with the assistance of a person of the cloth. While these methods are effective, they are temporary, because you are showing that you are not strong enough to stick up for yourself, and therefore the energy will just keep coming back to you. Smudging is a common method, and is the most effective in my opinion. It is widely used in many cultures and, although it isn’t always completely effective and may need to be accompanied by other methods, it is the easiest for someone to do. 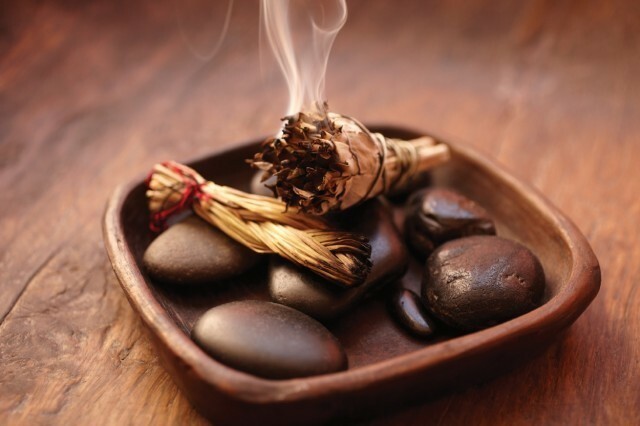 To smudge, you will need either a woven stick of sage, sweetgrass, birch bark, or a combination of the three, or a fireproof vessel to carry the burning herbs in. Birch bark is not commonly used, but can be very effective if you can get it. You will also need a feather, or piece of card, to fan with. While many people go to the trouble of getting an abalone shell and blessed feather to do it with, this is not truly necessary. It is the smoke, not the instrument you use to distribute it, that does the job. You will need to burn the herbs and fan the smoke around the room and the house you want to clean. Do not start outside, as this may seal the entity or energy you want to dispel within. Start at the center or the lowest point of the house, like the basement. go in a circle of the same direction on each floor of the house, smudging the walls, entryways, including the windows, and the light fixtures in each room. While you do so, concentrate on what you want to happen.For example, If you’re trying to end fighting within the home, concentrate on a happy relationship resulting from your actions. Make sure you focus on it the whole time, and do not think of the negative things that have been happening, or you may be causing more negativity in the space. When you have smudged everywhere inside the house, you will want to go outside and smudge all around the exterior of the house, on the outside of every entry. If the house is multistoried, let the smoke float up the outside of the house, trying to have it touch the outside of the house all the way up. (This may be easier on a non breezy day.) When you have smudged everything completely, your house should be cleansed, at least partly. To maintain this, you can get yourself some bowls of acorns to put around, which are extremely proficient at driving out negativity, as well as some himalayan salt sculptures, chunks, or lamps. For permanently sealing your home, you may wish to get yourself a box of salt and salt all the way around the foundation of your home. If you do so, keep in mind that nothing will ever grow out of salted ground again, so you should keep it right against the concrete where nothing really grows, anyways to avoid killing plants. You should also consider, that once you completely seal the home this way, nothing will be able to come in- but nothing will be able to get out, either. Should you fail to completely remove the negativity, it will remain forever within the walls and feed off of whoever lives there. Even worse, should you have a fatal accident inside the house, it is argued that you may find yourself unable to leave and move on once the house has been sealed. As with anything else, choose carefully- and weigh the pros and cons of each action before you do anything, because in the case of salting, it very often cannot be undone.